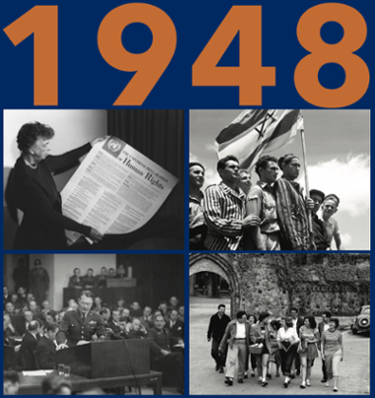 The year of Brandeis University's founding--1948--marks an epochal turning point in world history. In the aftermath of the Second World War and the Holocaust, distinct notions of promise prevailed and informed numerous visions of creating a safer and more human world order, among them the Universal Declaration of Human Rights and the Convention on the Prevention and Punishment of the Crime of Genocide. The evening's discussion reflects on Brandeis University in the context of the postwar history of the American Jewish community. Co-sponsored by the Bernard G. and Rhoda G. Sarnat Center, International Center for Ethics, Justice and Public Life, Center for German and European Studies, and Leibniz Institute for Jewish History and Culture - Simon Dubnow.